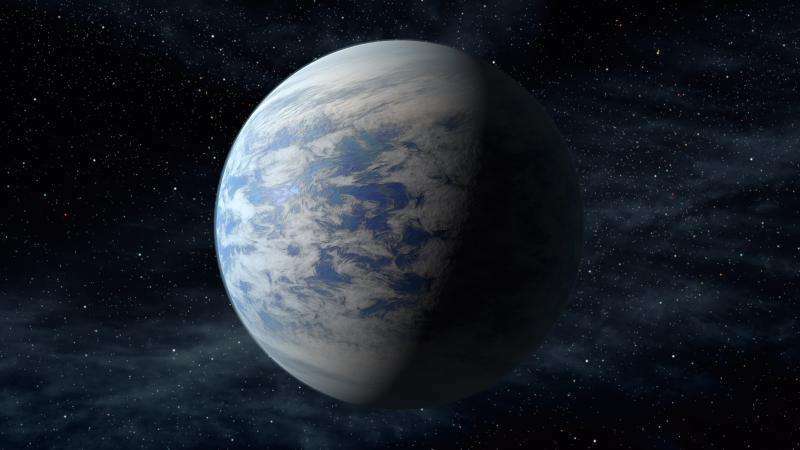 On July 6, a team of astronomers proposed a new type of mission to crack some of the universe's most intriguing mysteries and search for life on distant worlds. University of Washington astronomy professor Julianne Dalcanton co-chaired the committee from the Association of Universities for Research in Astronomy, or AURA. The group unveiled what Dalcanton described as a "call to arms," a detailed proposal for a deep-space telescope to peer far into the cosmos. Members see this ambitious mission as a worthy successor to the Hubble Space Telescope – NASA's Earth-orbiting observatory that revolutionized our knowledge of the universe since its launch in 1990 – and upcoming missions like the James Webb Space Telescope, launching in 2018, and the Wide-Field Infrared Survey Telescope, launching in the mid-2020s. "If we think about what we want in the sky after the James Webb Space Telescope, we need to start thinking about it now," she said. "These are decades-long projects. No mission happens accidentally. AURA thought that it was time to start looking ahead to find a path forward that is scientifically transformative but also technologically possible." Dalcanton and her colleagues propose the High-Definition Space Telescope, or HDST. This observatory would sit more than 1 million miles from Earth—far beyond the orbit of the moon—where it could search for Earth-like planets around distant stars. The telescope would employ its nearly-40-foot-wide mirror to detect light from faint planets, after suppressing the light from the much brighter stars they orbit. Scientists on Earth can analyze the light signatures from those planets to determine the composition of the planets' atmospheres and look for chemical signatures similar to Earth's. "The goal is not just to find watery planets with rocky cores," stressed Dalcanton. "We want to find atmospheres that have been shaped by the presence of life." An alien astronomer measuring Earth's chemical signatures, for example, would probably be stunned to find that our atmosphere is over 20 percent oxygen gas and contains significant amounts of methane. That would be an unexpected combination for a lifeless planet, and a sign that Earth is no ordinary world. "If you leave an atmosphere up to its own devices, it wouldn't have both oxygen and methane," said Dalcanton. "The only reason we have both is because life is shaping the atmosphere." HDST's giant mirror and other technological advances would give this space telescope greater sensitivity than any of its predecessors. It will be able to see planets whose reflected light rays are 10 billion times fainter than the stars they orbit. 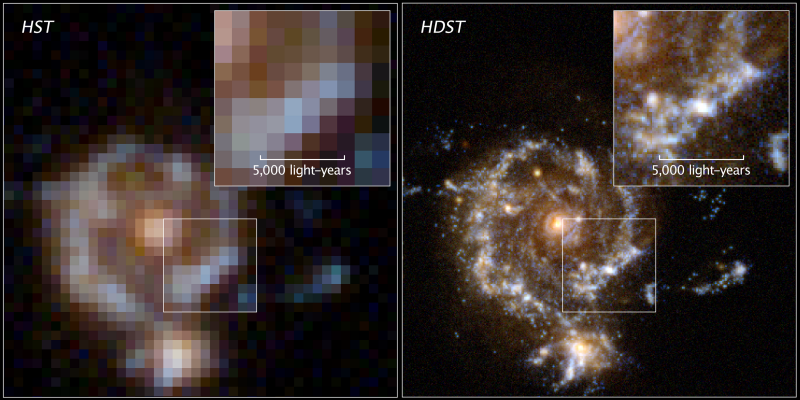 HDST's resolving capacity would also be 25 times greater than the Hubble Space Telescope's, producing sharper and more detailed images. The telescope would be 100 times more sensitive than Hubble to ultraviolet radiation, which will allow scientists to observe how galaxies recycle cosmic gas, dust and other materials in a billions-year cycle of star birth and death. HDST is part of the next-generation vision for advances in astronomy, said Dalcanton. Through proposals and rigorous advocacy for the Hubble Space Telescope and other missions, her predecessors sowed seeds for today's discoveries. Upcoming missions like the James Webb Space Telescope will fuel discoveries over the next decade. But Dalcanton said she and her co-authors want to think far into the future. "Hubble launched 25 years ago when I started grad school, and at lot of us in my generation realize that we have to pay this success forward," she said. "I would like to see the High-Definition Space Telescope in the sky because there will be another astronomy graduate student who's going to have a fantastic career of discovery using it." Dalcanton, co-chair Sara Seager from the Massachusetts Institute of Technology and their team discussed HDST with a presentation and panel discussion July 6 at the American Museum of Natural History in New York. The event coincided with the release of the committee's full proposal for the High-Definition Space Telescope. Dalcanton hopes this report will guide and influence astronomers, engineers and policymakers as they decide which major projects to pursue in the decades to come. "This is a chance to get people excited about something that could be their children's Hubble," Dalcanton concluded.